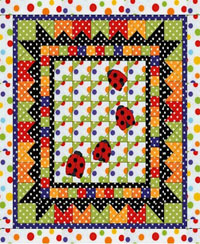 Wendy from Ivory Spring is hosting a quilt-along that will show you how to create this darling ladybug quilt using the Polka Dotville fabric line. I wonder if those ladybugs are appliqued on the pieced top. Join in and find out. Finished Size: 44" x 48"